For a few rare souls, the pleasure of the world holds no fascination or temptation. Through many thousands of lifetimes, they have lived and gained wisdom about the impermanence of the world. For them renunciation of the world is natural. They wear simple saffron-hued robes, signifying their vows of renunciation, purity, and service. They wander about with no aspiration other than the realization of God. They come close to the Lord by binding themselves to the service of humanity. It is truly rare to find such pure and dedicated souls. This is not a path that is right for most people, but it becomes possible for a very few after many, many lifetimes of seva (service) and tapasya (spiritual austerity). When many lifetimes of saadhana (spiritual discipline) bear the fruit of spiritual wisdom and direct perception of the Lord the ideal of Sannyas become attainable. For them, the attachments to the world have been severed by the Light of Divinity. They transcend the worldly fetters and help others to free themselves from the things of the world. They offer themselves in service, like a candle which burns itself to offer light. True renunciation comes from purity and wisdom. It occurs when there is experience of Divinity. It occurs when there is no attachment to the limited aspects of self like body, mind, name, status etc. It occurs when there is no reaction to the things of the world. Though the Sannysin may be in the world, the things of the world have lost the power to effect him, because he has learn to identify with his true Divine self. It is easy for him to respond to experiences that are very painful and experiences that are very pleasurable with perfect steadiness. He has developed the spiritual characteristic of vairagya (dispassion). From his detached perspective, he simply observes all things, and never judges. It is natural for him to be calm and happy even as the soul leaves from the physical body at the time of death. He does not judge or criticize but only ever loves. His existence has a stabilizing effect on the consciousness of society. Such a rare soul is a blessing to the world. Renunciation is not the repression of desires or attachments, but the attachment to the formless absolute within. Karma (action) arises from desire. Even the Sannyasins and Saints must have some desire, or they would not be in the world acting out the Divine lila. The Sannysin is not completely devoid from desire. Instead, he has redirected his desires toward the goal of Realization of the True self. He works for this by serving all with patient , loving, compassion. For him, renunciation arises naturally when the things of the world have been mastered. A poor man cannot renounce money, because he is learning about money. It is only when someone has a thing that they can renounce it. How can someone renounce what he does not have? A wealthy man can renounce money, because he has money to give up. It is only when there is true mastery over the external things that they can be renounced. This is a process that can not be forced but happens naturally as the soul matures through many lifetimes of practice. A Sannyasin is called Swami (meaning master) because he is a master of his body and mind and the external world. If there is sickness, the body cannot be renounced. Sickness is an indication that the soul is still working to gain mastery of the body. Likewise, if the mind is out of control, it cannot be renounced. Renunciation is not the avoidance of problems, but the mastery over them. This comes as people learn to face and experience life and the many fruits of previous karmas that it will offer. A person who has any difficulties or attachments in their family life, cannot renounce this lifestyle. Their karmas are best faced as a household. It is important for a Sannyasin to have mastery in all aspects of the material life. Then the renunciation will be true and the world will renounce the sannyasin. When his soul comes to the rare peak of attainments, and embraces the ideal of sannyas, the world will renounce the Sannyasin. To him all things are a blessing in his path. He roams around free from possessions and attachments. He has no family, no friends and no support but that which flows from the Lord. He has no preference for one person or situation, but embraces all with equanimity and acceptance. His mother and father and teacher and lover and friend is the Lord he serves. The Sannyasin is truly a rare and gifted soul, but his most important gift is humbleness. When others compliment him, though he has worked hard for many lifetimes to gain many talents and skills (and likely recalls this), he will admit only that he has been very blessed by God and Guru. This humble Sannyasin is a true master. He neither boasts about his successes nor complains about his difficulties or failures. To him it is simple to see that all are equally worthy and good. To him all things are people and things are the Lord he loves. They are his true self. They are nothing other than the manifestation of the Lord blessing his soul. Through those rare souls who have offered themselves completely to the service of the Lord, the Lord blesses the people. His existence is a light to the world. Through the humble Sannyasin, the people receive the blessings of the Lord. Through him they come to know the Lord. They are the Lords hands on Earth. "The Divine Nectar of immortality is not gained through action, progeny, or attainment. It is attained through renunciation alone. The Swami (the master) who has conquered the senses (and transcended the delusion of duality) attains this transcendent Truth that is supreme over heaven and illuminates the whole universe from within the cave of the heart. He attains purity of heart by binding himself to renunciation with a singular focus. He becomes established in the Truth that is the cause of nature and science and praised by the scriptures. He becomes elevated to the state of the formless Absolute by dissociating from the body, the emotions and the intellect. He transcends space and time and the causes of suffering. He is, verily, the source of creation, preservation and destruction throughout the universe and the planes (lokas). He is higher than the Angels (Devas) and beyond the Heavens. The Supreme Being shines radiantly, flawlessly and free from all sorrows and limitations within the lotus of the heart. This eternal bliss is the inmost essence of one’s being, attained when the mind and senses have become stilled by spiritual austerities (tapasya). It is attained by Swamis, who maintain constant awareness of their inner nature. Such a Swami transcends character flaws and selfishness. He sees himself to be omnipresent in all things. He serves all by the Divine Love that flows abundantly from within his heart. This inner essence of all things is worthy of worship. The saMnyaasi is worthy of worship (because of his union with the God who pervades all things). He alone is the supreme Lord; transcending all things but pervading the universe. He is the beginning and end of the Veda (and all knowledge). The world emanates from Him by His command. All will merge into His transcendent being. He is the inner nature of all. He is the Lord and the formless Beyond." "The heart of the holy trembles not in fear. All passions stilled, it enjoys calm unruffled. Neither is there death nor pain, nor night nor day, nor fruits of karma (action) to experience. That truly is the state of those who have renounced desire. " "God is awakened in the Soul. God breathes in the soul. Wisdom is more active than all active things... oh, how happy is this soul that is ever conscious of God resting and reposing within its breast." "Without regard for themselves, without urges and efforts, absorbed in contemplation and established in the Divine Self, they endeavor to remove misconduct and surrender their bodies by renunciation. These great souls are bowed to for their purity, which has a stabilizing effect on the consciousness of the world. These renunciates are likened to a pure white swan soaring above the attachments and miseries of the world. " "Never forget to say to yourself, and to teach to your children: as is the difference between a firefly and the blazing sun, between the infinite ocean and a little pond, between a mustard-seed and the mountain of Meru, such is the difference between the householder and the Sannyasin!" "Everything is fraught with fear: Renunciation alone is fearless." "Blessed be even the fraudulent Sâdhus, and those who have failed to carry out their vows, inasmuch as they also have witnessed to the ideal and so are in some degree the cause of the success of others!" Though Swamiji took Sannyas in about 2005, according to the instructions of his Guru, he is now living as a Grihasta (house holder). 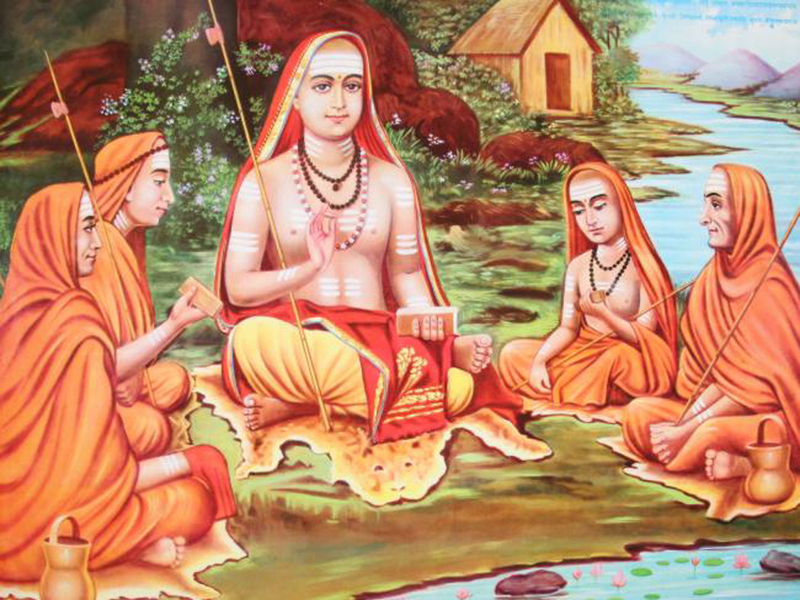 His practice of Sannyas for the time before his ordination, and for the five years or so he wore orange and lived as a Sannyasi, have taught him much about the path of Sannyas. He has noticed that there are very few souls in this world who are truly, inwardly drawn to the path of Sannyas, though many seek temporary solace in this path when the difficulties of life seem too difficult to bear. True Sannyas arises from spiritual wisdom and inner light and has nothing to do with any external practice or lifestyle. Sannyas is an inner practice which can be done in the world, yet the ancient tradition of renunciation has many advantages for the serious seeker. These practices are not best for all, but for certain souls at a particular point in their spiritual development, these outward practices can be very useful as a quick path toward realization, provided a person is truly dedicated through and through to seeking God beyond the world. These practices are useful for a time and are surely worthy of the highest respect, but like all things, even the practice of Sannyas must be transcended. Just as the Guru is necessary at first but in time must be transcended to find the inner Guru. Swamiji does not teach that his practice has transcended Sannyas, but only that when his Guru's asked him to practice Sannyas, he did; and when the Guru asked him to marry, he did. He continues to practice the spiritual vows he took within his marriage, but he wears white and tells the world that he is a grihasta. He also works for money to support his beloved wife, Ranjini. The saffron robes are traditionally worn by those who are practicing celibacy and who do not work in the world for material gain. To pay respect to this great tradition, Swamiji wears white. In 2010, after having received Sannyas, Swamiji was instructed by his Guru to marry one German devotee of Mata Amritanandamayi whom he had never seen and had spoken to only a few times before he proposed. Having had visions of Swamiji and the place where the couple was to marry, even before the couple met, she quickly agreed. With the blessings of his Sannyas Guru, Swamiji married in Jan. 2011. Though Swamiji now wears white and lives the outward life of a Grihasta (house-holder), he remains focused on his spiritual practice and his mission. He believes and teaches that neither the path of Sannyas (renunciation), nor the path of the House-holder is better, but just different practices for different dispositions. Swamiji believes that his marriage has been a true blessing and a great opportunity for learning and teaching. He remains dedicated to his wife and is thankful for the opportunities his marriage has offered to learn and teach the spiritual practice of Love. He teaches that the inner attainment of spiritual dispassion is needed in the Sannyai path or the Grihasta path. The spiritual quality of vairagya is rare today in householders and renunciations alike. Each soul must know which path is most suitable for its development and follow that path with faith, devotion, and practice dispassion. Swamiji has personal experience of the life of Sannyas and that of the householder, and helps seekers to dicern which path is most suitable for their own development and guides Sannyasins and householders alike. O fearless souls, O bastions of divine effulgence, come near! Be engulfed by the splendor of your transformation. Cast your flesh into the fires of penance and rise from the ashes like a watchtower. You shall guard the keys to the Kingdom and perpetuate the awakening of humanity. For this work, you have been called. You, my sons and daughters, have been chosen before we had come here. My very breath is dedicated to your fulfillment. It is awakening now from within you. You have been here before, and there is nothing to do again. Though you are ready already, when you are ready you will return. You shall find your Guruji when he is ready for you, and his Love shall light your fit kindling. Be dedicated to his vision for you. He will fill you with Him you are. His gaze will burn away what has stained your soul. He is a bridge; and you are the fodder. You are full already, but you have not seen your fullness. Deny your emptiness even when it denies you. Rejoice when you are broken. Bless those who work to kill you. They who destroy you shall be your savior. You are perfect in his Eyes but you cry out to be broken. He is working for your salvation with constant love and attention. From within all things He is uplifting your soul. Be kind. Be still. Be calm. Be humble. Be generous to love and accept all that is as His alone. No things are good and no things are bad. All things are the Lord's perfect fulfillment of His promise to you. All things are the Lord alone. You are His blessing to the world. Everything is God. Everything is Good. Everything is complete. There is not one thing which is out of place. The Lord is doing all things, and they are finished already. There is no thing that shall prevent your destiny. You are the fulfillment of all you seek. You have great faith, so your sacrifice shall be great, your success shall be great. You are neither here nor there. You do not dwell nor persevere. There is none other than your Self. You are the Lord of all, blissfully permeating all that is. You are the Source of the universe hidden in the hearts of men. There is a very special group of souls being currently reincarnated to fulfill Lord Dakshinamurti’s vision of support to the spiritual awakening of the people. They will serve selflessly, sacrificing completely their lives to the loving service of the world through the Maths of the Shuklabhadra sampradaya. Swamiji has recognized many of these souls already. They shall rise above the materialism and fear that has been shadowing the world to shine like paramahamsas. Shrii Paramahamsa Gananathamritananda invites all serious applicants under the age of 25 to contact him. He recommends that interested seekers study the spiritual teachings on this website and that they practice sandhya vadanam. He is happy to guide serious and dedicated seekers who feel a calling toward Sannyas. They should understand the training process for the Swaminis and Swamis of the Shukla Bhadra Sampradaya. The attainment of these SaMnyaasis of the Shukla Bhadra Sampradaaya will be great. The standard for SaMnyaasis is extremely strict in the Mathas of the Shukla Bhadra Sampradaaya. If there is doubt in the mind of those who are considering applying as to their qualification for this training; they should know that only the most dedicated will be ordained into these Catur Mathas. The attainments of the Swamis of the Shukla Bhadra Sampradaaya shall be unique toward the spiritual awakening of the entire world. Their success shall lie in the obedience that rises from the mindfulness that rises from the humbleness that arises from the compassion that arises from the renunciation of the SaMnyaasins. Their place has been chosen before by their many countless lifetimes of service as SaMnyaasins. Their success is natural and simple. May their efforts multiply offered at the feet of the Great Lord of Time (Mahaakaaleshvara). AUM namah shivaaya.